I noticed cradle cap on Oscar’s head just a few weeks after he was born. It wasn’t very pleasant looking but after googling cradle cap images, I realized that his wasn’t that severe after all. Weeks went by that I didn’t actively try to get rid of it, but during bath time I would shampoo and rinse his hair thoroughly and apply some oil (from his baby massage class) but I never went further to comb through his hair. I figured it might soften and just go away itself. You see Olivia never had cradle cap, so I hadn’t experienced this before. After a while, I realized his scalp wasn’t clearing up (in fact it seemed to be getting worse). Looking back, if I had of just used a comb after my initial routine, maybe I would have got rid of it that way, but now I’ll never know. So two weeks ago we were visiting family and Oscars cradle cap was brought up in conversation. Straight away I was told that coconut oil will do the trick! 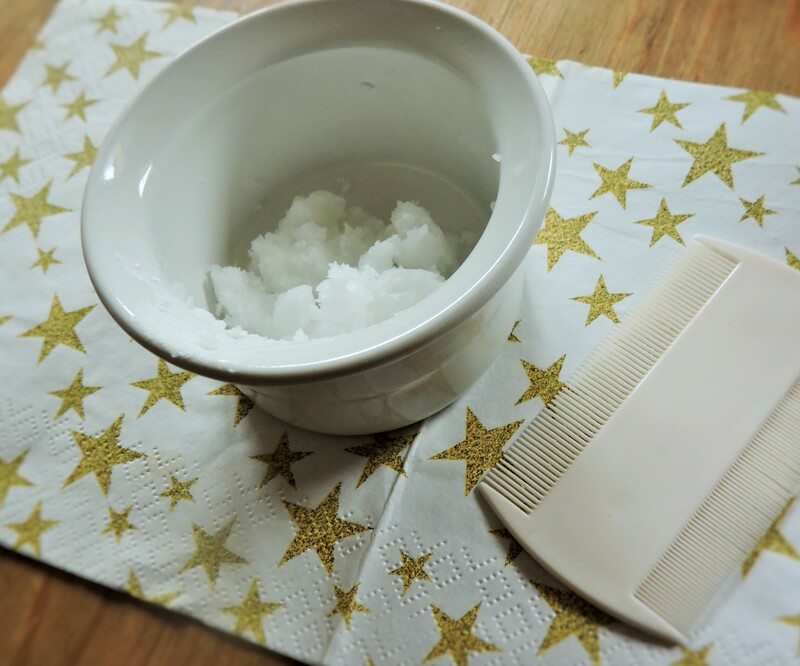 Obviously I know there are products out there aimed to clear up cradle cap, but like I said I wasn’t actively trying, so I figured I had nothing to lose with coconut oil first. We had it in the cupboard already and we had only used it the night before to make a green curry and now it was possibly going to clear up Oscars cradle cap – I thought to myself ‘this is great, I won’t have to buy anything from the pharmacy’. The following day I tried the coconut oil. (We have Tesco’s own brand by the way). I scooped some out into the palm of the my hand and it quickly melted, then I gently rubbed it onto his scalp but I left it on him longer than the ten minutes because he fell asleep. (I just couldn’t disturb my napping baby) So when he woke, I got started immediately. I placed him on a towel and started combing with a small comb (that you would use for head lice). Oil should melt in seconds. Waiting for the coconut oil to do it’s thing! I’m not kidding, it was the most satisfying thing that I have done in a long time! Seeing the dry skin lifting off was grossly enjoyable. I just kept combing and combing and skin kept lifting and lifting. I stayed at it until I noticed his head was becoming red. I didn’t want to continue as I figured it would be uncomfortable for him, so I washed his hair and dried it. Straight away I could see a difference, I could see more of his hair that seemed to have been held down under the dry skin. I was so thrilled to notice the improvement. I repeated the exact same routine the next day and it pretty much removed 90% of the cradle cap. My third attempt was to remove finer patches that I had missed and today Oscars scalp is clear of cradle cap and it’s all thanks to a natural remedy already in my kitchen cupboard. Oil is washed off his scalp. Ha I hear you on how grossly enjoyable removing cradle cap is!! Coconut oil is a great alternative to baby oil (which I hate! )….must add this to my bag of tricks! I came across your articles at https://oliviasmotherblog.com and observed you’ve got useful and interesting information for your readers. PreviousPush Presents – Just how popular are they?